18k Gold 7mm Diamond Wedding Bands Rings 0901. 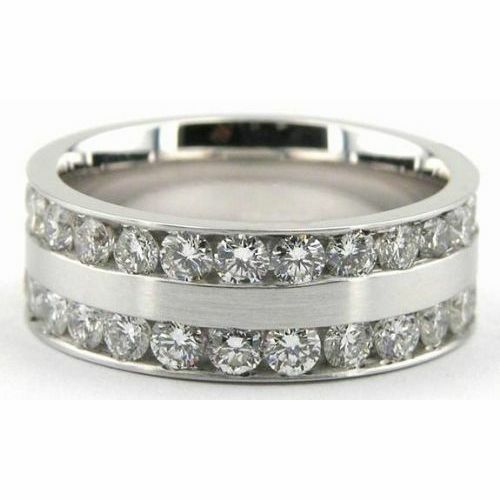 This 18k Gold Diamond Wedding Ring is 7.0mm wide. The band is rounded on the inside, creating a comfort fit for constant wear that will not pinch the skin and still slides easily on and off of the finger. 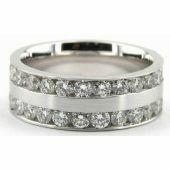 The ring is set with approximately 70 Round Brilliant Cut Diamonds, which are set in 2 channels close to each edge of the ring. The carat weight of each stone is 0.04ct. The Total diamond weight is approxamitely 2.80ct. The number of diamonds may vary, depending on the ring size.